Cutting out stencils is one of the most known techniques of street art. The original purpose of stencils was to quickly reproduce and spread political messages in public space. By now, they have developed to an individual art genre with heavy influence on street art. Through the CUT OUT-show, the two curators Felix Rau (eins92) and Rudolf David Klöckner (urbanshit), gather eighteen of the most interesting stencil artists of Europe under one roof. 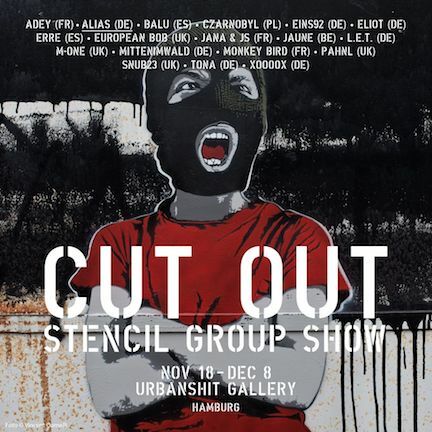 By exhibiting one work per artist, the show not only reflects the status quo of stencil art but also brings back stencil art to Hamburg in a highly concentrated form.